The horizontal stab is a simple piece and is laid out on the bench in the same way as the other tail components. Here are all the tubes cut, coped and blocked into position and ready for the gussets. The most demanding part of this stage is bending the leading edge tubes, the plans call for a rather sharp bend. I used the 14" bending form and eventually ended up with two identical tubes. It is very important to remember to slide four hinges onto the spar before riveting the gussets. 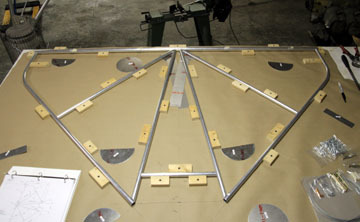 The gussets were riveted on one side, then the stab was flipped over so the other side of the gussets could be secured. Careful measurements were taken to assure the stab is square with the fuselage. 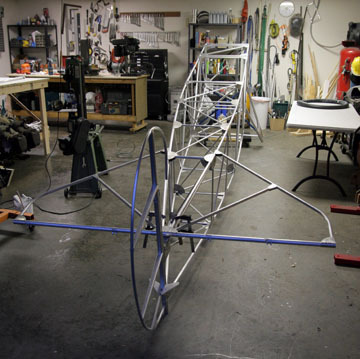 I am pleased with how this assortment of tubing has resulted in a very square and straight airframe. No shimming will be necessary to get the stab perpendicular to the rudder. The fuse jigs really did the job. This photo shows the stab just before holes were drilled for AN-3 bolts to secure it to the fuse longerons. 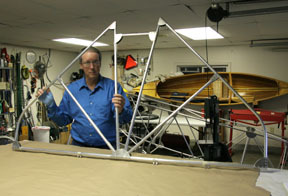 Now the stab braces, vertical stab, and turtledeck stringers can be fabricated along with finishing the rudder.